ODC/Dance celebrates an astounding milestone this year – their 45th Anniversary season! And the repertory for their annual Dance Downtown at Yerba Buena Center for the Arts speaks to this company’s deep legacy, thriving present and robust future. Last week’s program featured the world premieres of Going Solo and Walk Back the Cat, along with 2011’s famed I look vacantly at the Pacific…though regret. Week two of Dance Downtown opened last night with a double bill – the world premiere of Kate Weare’s Giant (co-commissioned by White Bird and ODC) and an encore of 2015’s Dead Reckoning by KT Nelson. Weare’s Giant opened with a striking visual image – two dancers (Jeremy Smith and Josie G. Sadan) silhouetted in a doorway upstage center. As the top of the doorway expanded, slowly edging into the rafters, and the lights came up, they walked forward into the space with stoic faces and long strides. The rest of the cast joined, each costumed in flowing gray with geometric accents (designed by Mary Domenico) – very sci-fi/fantasy in nature and quality. An assortment of patterns, groupings and formations burst from the stage, all informed by Weare’s eclectic choreography. A futuristic first statement, it looked a little like a scene from Tron, the original not the remake. The group dissipated and a number of varied vignettes followed. And varied is a key word here. Differing in style, intention, dynamics and scored uniquely, these solos, duets and ensemble scenes each brought new information to the table. One variation was filled with small reflexive movements and pulsing articulations, another like gears of a machine with repetitive, measured, careful motions. The men’s quartet soared with its shifting mid-air lifts and the women shared an aggressive ritualistic dance. A collection of diverse movement ideas placed together in a single work; a stream of consciousness expressed in physical language. All of the choreography was engaging, the design drew the viewer in and the dancing was strong (it was also incredibly exciting to see a number of new faces in the company). Yet, as much as I enjoyed these aspects of the piece, Giant didn’t particularly resonate with me. I found its conceptual and structural throughline to be fairly elusive. Without that connective tissue, the dance felt compartmentalized, and many of the segments, unrelated. Some of the observations that I made at last year’s premiere of Nelson’s Dead Reckoning held true at this performance. 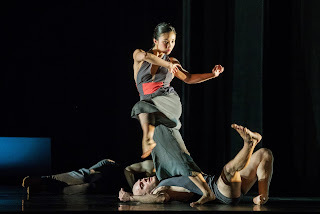 In its exposition, Dead Reckoning breaks forth with contagious energy – bodies in flight, traversing every inch of the stage space, running circuits and changing levels. As the work moves to its final section, that pulse resurges (though not exactly the same as in the first movement). And the visuals stun with pure beauty - the cast and stage immersed in lime green ‘snow’ (concept by Yayoi Kambara) that has been falling throughout the dance. It was the middle section in Dead Reckoning that felt very different. While I was a little puzzled last year by this portion of the piece, at this second viewing, its function actually spoke quite clearly. The opening segment is all about bodies in motion at a high intensity level. In the middle section, these same bodies communicate different styles of motion and introduce new levels of intensity – Smith’s slow, stretchy solo; Sadan’s spinning, spiraled musing; the sculptural poses of the women’s trio; the weighty lifts; the rhythmic, methodical footwork pattern across the stage. And these different ideas are brilliantly layered like a collage - independent yet interdependent at the same time. The middle chapter of Nelson’s Dead Reckoning provokes the viewer to consider physicality from a wide lens yet in the context of a cohesive container. How many different ways can bodies move through space? How do distinct tempi co-exist in a single work? Which dynamic is each individual viewer drawn to, and why? "L’Allegro, il Penseroso ed il Moderato"